Here we use a classic Cross model to visualize what happens to viscosity as shear rate is changed. where tη inf is the viscosity at (essentially) infinite shear, η 0 is the viscosity at zero shear and α and n are fitting constants. The same formula handles dilatant systems where the viscosity gets higher with shear. The explanation for that is a log-jam effect where particles/polymers can't respond (reorientate) quickly enough when bumping into each other. 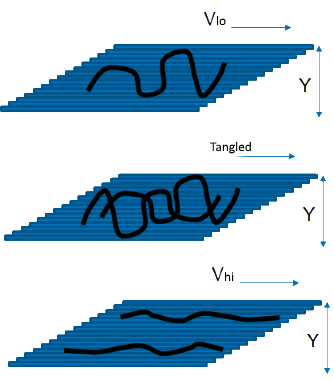 Different parts of your process create different shear rates and therefore different viscosities. It is easy to estimate the shear rate for any given process. Squeezing an adhesive or paint at 5cm/s from a nozzle that is 0.5cm diameter gives a shear rate of 5/0/5=10 while the same adhesive being squeezed or paint being applied as a 10μm layer at 0.1m/s gives a shear rate of 0.1/10 -5=10 4. Enter the estimated shear rate and the relevant viscosity and shear stress are calculated. The equation blows up γ̇<1 so the value is fixed at η 0 for these values. The reason some people use the power law curve is that they can provide a single number, sometimes called "P Ostwald", to use on, say, a product data sheet.